Mac Danzig (born January 2, 1980) is an American mixed martial artist, who competed as a lightweight in several MMA promotions, most notably the Ultimate Fighting Championship. Danzig, of German and Scots-Irish descent, grew up in the greater Pittsburgh area before moving to Los Angeles to pursue his career. In the past, Danzig was known for his association with R1 fight team (formerly RAW) and had been a student of Iowa wrestling standout Rico Chiapparelli and MMA fighter Frank Trigg. Since then he trained boxing extensively at both the Wild Card gym in Hollywood, California under Freddie Roach assistant Justin Fortune, and also Gil Martinez in Las Vegas, Nevada during his time on the Extreme Couture MMA Team. While Danzig is known as an impressive grappler, having scored 12 of his victories by submission; he has proven himself to be an adept striker, most notably with his KO victory over Joe Stevenson and his TKO victory over former lightweight champion Takumi Nakayama. After defeating Royce Gracie black belt Buddy Clinton on August 4, 2006, Danzig increased his winning streak to 12 in a row with a unanimous decision victory over Miletich fighter John Mahlow on September 29 in Calgary, Alberta Canada. Danzig then lost his KOTC title to Clay French on January 19, 2007 by split decision. In his first major fight, facing Hayato Sakurai at PRIDE 33 on February 24, Danzig lost the fight by KO (punch) at the 4:01 mark of round two. 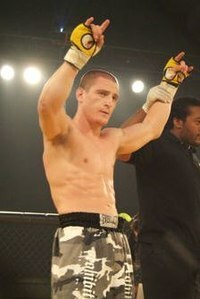 Mac was a contestant on The Ultimate Fighter 6, Danzig defeated Joe Scarola in a preliminary fight and later defeated John Kolosci to make it to the semifinals. He then defeated Kolosci (who had replaced an injured Matt Arroyo) again, and moved on to the finals where he submitted Tom Speer in the 1st round to become TUF Season 6 winner. Danzig made his official UFC debut on December 8, 2007, where he won The Ultimate Fighter 6, defeating Tom Speer in the finals via rear naked choke at 2:01 of the first round. Before the fight, Danzig stated his intention to drop down in weight class to lightweight whether he won or lost, citing the size difference between himself and most of the other UFC welterweights. Danzig made his return to lightweight by defeating Canadian Mark Bocek via third round submission at UFC 83 on April 19, 2008. On September 17, 2008, at UFC Fight Night, Danzig lost a unanimous decision to Clay Guida, who used his wrestling to control Danzig. Danzig gave Guida some problems on the feet in the first round displaying crisp striking skills. In the second and third rounds though, Danzig succumbed to Guida's wrestling offense, as his opponent controlled him for with takedowns and top control. At UFC Fight Night 17 he lost via triangle choke to Josh Neer. Both Danzig and Neer received Fight of the Night honors. The loss dropped Danzig to 1–2 in his post-TUF career. The two fighters exchanged on the feet quite evenly in a back and forth fight, but Neer's active guard caused Danzig problems as he was caught in the fight ending submission after getting on top following a scramble in the second round. Danzig lost to Jim Miller at UFC 100 on July 11, 2009 at the Mandalay Bay in Las Vegas via unanimous decision (30-27, 30-27, 30-27) making it his third consecutive loss in the UFC. Danzig defeated Justin Buchholz on February 6, 2010, at UFC 109 by unanimous decision with all three judges scoring it 29–28 for Danzig, snapping his three-fight losing streak. Danzig was defeated by Matt Wiman via first round technical submission at UFC 115. The stoppage was considered controversial by many as Wiman had Danzig in a guillotine choke, and referee Yves Lavigne called a stoppage despite the fact that Danzig had not submitted and was still conscious. Danzig was expected to face Wiman again on September 15, 2010, at UFC Fight Night 22, but pulled out of the fight due to a chest injury sustained during training. Danzig then faced Joe Stevenson (season 2 Ultimate Fighter winner) on December 11, 2010, at UFC 124 and earned his first KO victory in the UFC at 1:54 of the first round. While moving backwards, Danzig landed a counter-left hook that sent Stevenson to the ground, and Danzig was subsequently awarded the Knockout of the Night bonus. Danzig was expected to face Donald Cerrone on June 11, 2011 at UFC 131 but had to withdraw due to a chest injury. A rematch with Matt Wiman took place on October 1, 2011 at UFC on Versus 6 with Danzig losing via unanimous decision in a bout that earned Fight of the Night honors. Danzig faced Efrain Escudero (season 8 Ultimate Fighter winner) on April 21, 2012 at UFC 145. He defeated Escudero by unanimous decision. Danzig faced Takanori Gomi on November 10, 2012 at UFC on Fuel TV 6, with Danzig losing in a split decision. Danzig next fought Melvin Guillard on July 27, 2013 at UFC on Fox 8. After a close first round, Danzig lost via knockout in the second round. Danzig faced Joe Lauzon on December 14, 2013 at UFC on Fox 9. He lost the fight via unanimous decision. After his loss to Lauzon, Danzig announced his retirement from MMA fighting on March 4, 2014. This concludes his overall record of 5-8 with the UFC. Danzig stated he retired due to concussions and accumulated brain damage. On June 17, 2017, it was announced that Danzig would make his MMA return on August 5, 2017 to face WSOF vet Joe Condon for the CFL Junior Welterweight Championship. He won via rear naked choke in the third round to become the CFL Junior Welterweight Champion. Danzig had a daughter, Nova, in November 2008. He has been a vegan since 2004 and is an animal rights advocate. Danzig is credited as a Mixed Martial Arts Consultant for the Nickelodeon television series The Legend of Korra. Mac is a semi-professional nature photographer who specializes in landscape and wildlife photography. In 2015 he married fellow MMA fighter Angela Hancock (now Angela Danzig) whom he coaches and trains. Together, they live in Bend, OR with 2 children. Danzig appears as himself in the 2011 documentary Forks Over Knives. Danzig also appeared as a guest on Joe Rogan's podcast The Joe Rogan Experience in 2012. In June 2018, Danzig announced via his Instagram page that he and his wife would be moving from Los Angeles and opening their own MMA facility known as Danzig MMA in Bend, Oregon. Win 5-1 Joe Jordan Decision (unanimous) ECT: 2001 US National Championships January 5, 2002 2 5:00 Davenport, Iowa, United States Became Extreme Trials 2001 National Lightweight MMA Champion. Win 3–1 Jason Halderman Submission (arm bar) EC: Extreme Challenge Trials August 25, 2001 1 2:42 Great Falls, Montana, United States Won EC Regional Amateur Championship. ^ Meltzer, Dave (August 27, 2007). "Participants in Ultimate Fighter season six are announced". Los Angeles Times.com. ^ "UFC 109 prelims complete with Danzig vs. Buchholz". mmajunkie.com. December 8, 2009. Archived from the original on December 13, 2009. ^ "Escudero vs. Wiman new UFN 22 co-headliner". mmajunkie.com. August 18, 2010. Archived from the original on August 20, 2010. ^ "UFC 124 Results: Mac Danzig Face Plants Joe Stevenson". mmajunkie.com. 2010-12-11. Retrieved 2010-12-12. ^ "Mac Danzig vs. Donald Cerrone grudge match slotted for UFC 131 in Vancouver". mmajunkie.com. March 14, 2011. Archived from the original on March 17, 2011. ^ "UFC on Versus 6: Matt Wiman vs Mac Danzig rematch set for October event". mmamania.com. July 16, 2011. ^ "Mac Danzig: I'm fighting Takanori Gomi at UFC on FUEL TV 6 in Macau". mmajunkie.com. August 27, 2012. Archived from the original on August 30, 2012. ^ Tom Ngo (April 3, 2013). "Melvin Guillard Meets Mac Danzig at UFC on FOX 8". 5thround.com. Retrieved April 3, 2013. ^ Tom Ngo (2013-09-18). "Joe Lauzon Faces Mac Danzig at UFC on FOX 9". 5thround.com. Retrieved 2013-09-18. ^ ShinSplints (2013-12-14). "UFC on Fox 9 results: Joe Lauzon leaves Mac Danzig bloody in unanimous decision win". bloodyelbow.com. Retrieved 2013-12-14. ^ "Video: UFC vet Mac Danzig announces retirement, cites health concerns". mmajunkie.com. March 4, 2014. ^ Jason Nawara (March 5, 2014). "Mac Danzig retires, leaves a wake of concussions and accumulated brain damage". mmanuts.com. Retrieved March 5, 2014. ^ "CFL 11 - Danzig vs. Condon". ^ "Danzig Breathes New Life into Career". Sherdog.com. December 11, 2008. Retrieved December 11, 2008. ^ "Mac Danzig juggles fighting and fatherhood". MMAWeekly.com. February 5, 2009. Archived from the original on February 17, 2009. ^ "Mac Danzig's Diet - The Truth About Vegan". ufc.com. April 5, 2012. Retrieved 2017-02-20. ^ "Mac Danzig". www.macdanzigphoto.net. Retrieved 2016-12-18. ^ "Mac and Angela Danzig (@danzig_mma) • Instagram photos and videos". www.instagram.com. Retrieved 2016-12-18. ^ "Mac Danzig - IMDB". IMDB. Retrieved October 19, 2017. ^ "Mac and Angela Danzig (@danzig_mma) • Instagram photos and videos". www.instagram.com. Retrieved 2018-06-12.